6.7 earthquake hits near Coquimbo, Chile. Residents in northern Chile remain on alert for aftershocks following a magnitude 6.7 earthquake at the weekend. Two people died from heart attacks and as many as 200,000 have been left without power. The quake shook homes and caused land slides. The tremor prompted the authorities to begin a mass evacuation of coastal areas ahead of a potential tsunami. The Pacific Tsunami Warning Center, however, later ruled out the threat. 5.7 earthquake hits southeast of the Loyalty Islands. In the Southern Hemisphere: Tropical cyclone (tc) 10s (Desmond), located approximately 172 nm northwest of Europa Island, is tracking north-northwestward at 09 knots. Madagascar – Heavy rains and flooding swept away houses in Madagascar’s capital of Antanarivo killing nine people, an official report said Sunday. 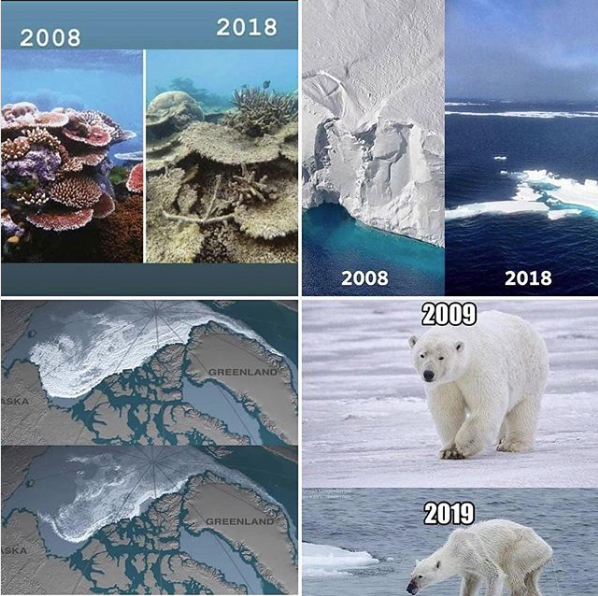 People concerned about climate change are posting before and after photos of glaciers retreating, bleached coral reefs, starving polar bears and drought-stricken landscapes to make a point about climate change.